I've been a fan of the Sisterhood series since back when the second book was just published and having found out a sequel had been written, I just had to read it. Now the Sisterhood are all adults and we see how things have changed along the years. The book starts out like the previous books, with the perspectives of each of the girl’s lives from the third person though Tibby is noticeably absent from this and all three of them mention how disconnected they’ve been from Tibby as she’s been in Australia and hasn’t been keeping in touch regularly with them.The four of them have lost touch and are not as close as they once were but Tibby gives them an opportunity when she sends all three of them envelopes with airplane tickets to Santorini. But once they read Santorini, something happens that changes everything and sends them in a tailspin.For someone who has read the previous books and no doubt, had a connection with the characters. This book was emotionally draining, every time I took a break from reading this I couldn’t help but feel a wave of sadness overcome me. You would like to think after Forever in Blue (the 4th book in the series), the girls all lived happily ever after but this book forces you to reevaluate that happily ever afters don’t happen, even in stories. That even if things seemed to be going in all the right directions in the beginning, along the road, it might not go the way you thought it would.Ann Brashares is able to deliver her story wonderfully and sets you thinking about your own life, not only the characters’ lives. Even after flipping the page, the words on the previous page haunt me as the words sink in. For me personally, I like books that are thought-provoking because it feels more personal and it helps you connect with the book so this was very enjoyable for me. 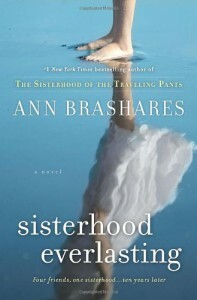 It was also so good to read up on familiar characters, I feel like Ann Brashares wrote this with the readers who read the Sisterhood back in the day in her mind. The readers who read the Sisterhood back then have all grown up just like the Sisterhood.In overall, this book was a satisfying read that kept me thinking and thinking and I just couldn’t put it down once I started. You might not feel as much of a connection as I did if you haven’t read the previous four books in the Sisterhood series so I highly recommend you read those first before reading this one because it might also be hard to understand the story if you read this a standalone.Review made by Gypsy Reviews.